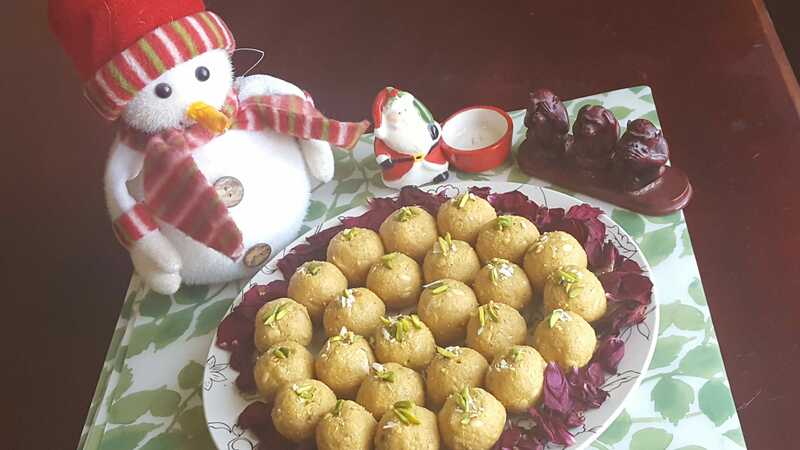 Besan ke Ladoo is a very popular sweet dish in India.These ladoos are made from roasted gram flour,boora or tagar and garnished with dry fruits.Besan ke ladoo are is an all-time favorite Indian sweet and made on several special occasions.My father liked sweet after lunch and dinner so in my house besan ladoo are made every time to be stored. First, heat the ghee in a deep heavy-based pan or iron kadhai, add cardamom powder, besan mix well and cook on a medium flame for10-15 minutes while stirring continuously then start smelling and color change to light golden switch off the flame and keep stirring for 1-2 minutes, add melon seeds, raisins, and almond. Transfer the mixture to a deep big bowl allow this mixture cool down little add boora and mix well, take a small mixture and shape it into a round ladoos.